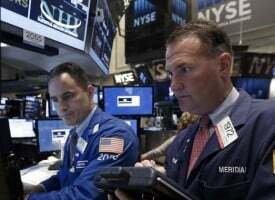 With global stock markets surging, today a 50-year market veteran warned King World News that a massive bubble is ready to pop and it's going to crush people. 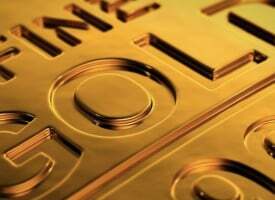 He also spoke about the action in the gold and silver markets. 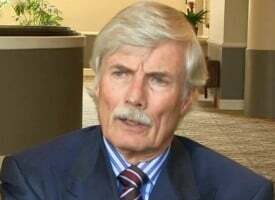 John Embry: “I’m focused on this interesting action in gold and silver this morning. They were smashed in an orchestrated raid late last week, and it was obvious that is was a massive algorithm-related selling bout that occurred at the usual times. Then you were subjected to the obnoxious headlines on Kitco, which if you understand these markets you would also understand are pure propaganda…. 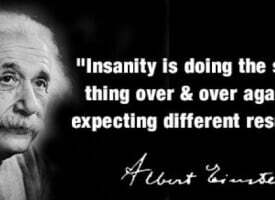 “Kitco is allegedly a gold site but it goes to great lengths to obscure the truth about what is really happening in the precious metals markets. Thus it is more than encouraging that gold and silver have rebounded so sharply this morning. Does it mean that we are out of the woods yet? I think you would have to ask the Bank for International Settlements, the Western central banks and their bullion bank cronies, to get an accurate answer, and I can assure you that they won’t be talking. All I can tell you is that gold and silver are remarkably cheap in a world where many other assets are dramatically overvalued. It is gratifying to me to see well-connected people coming out of the woodwork and questioning the ultimate outcome in a world where negative nominal interest rates are proliferating. I think this is a horrifying development that is going to end badly. In this environment, it’s not surprising that stock markets have become extremely overvalued, as investors search desperately for a return on their money. To me this is a very risky game, and if history serves as any guide, it’s going to end very badly. Embry added: “I want to talk about an overvalued asset that has recently been in the news and that’s Canadian housing. 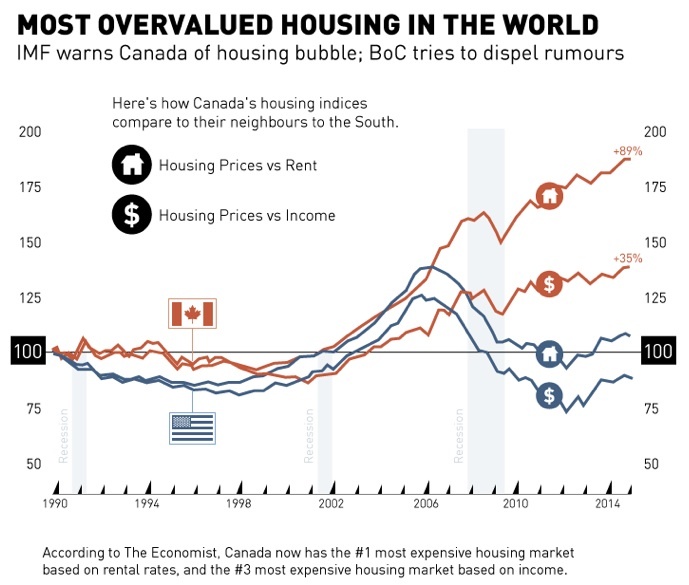 Canadian housing made the headlines again when the Economist said we had the most overvalued housing market in the world. That honestly surprised me because I didn’t think we were the most overvalued in the world, but seeing what’s been going on in the neighborhood I’ve been living in for the past 15 years, I’m not going to take issue with that statement. Prices are going bonkers in my neighborhood. Nevertheless, Prime Minister Harper said he didn’t anticipate any housing crisis in Canada. 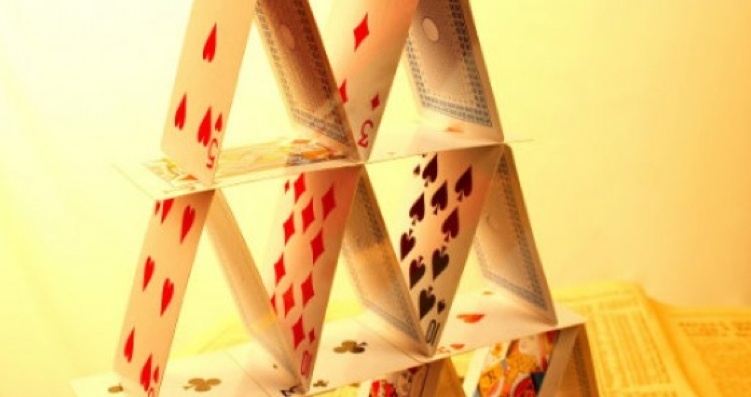 And the head of the Bank of Canada, Stephen Poloz, said he didn’t believe Canada was experiencing a housing bubble, after he previously acknowledged that housing in Canada appeared to be at least 35 percent overvalued. Well, the problem with bubbles is that you don’t always know you are in one until it’s too late. In my mind there is no doubt that Canada has experienced a major housing bubble and I feel very sorry for the young people who are way in over their heads at this time with far too much mortgage debt. 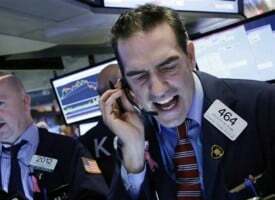 When the bubble pops, it’s going to crush many of these people.” ***ALSO JUST RELEASED: System-Wide Financial Bail-In And Global Financial Meltdown CLICK HERE.